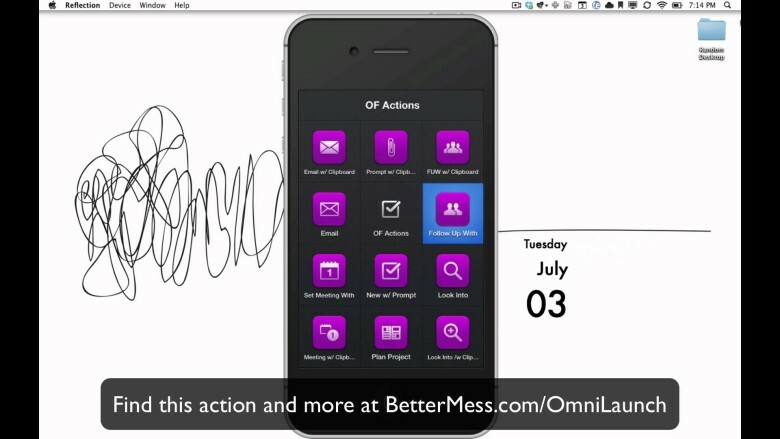 Do you use OmniFocus on your iPhone? Do you use Launch Center Pro? Then you need to watch the above screencast, put together by Michael Schechter of A Better Mess. It uses the latter to create shortcuts and snippets of text to enter into the former, and makes the whole thing way, way faster. Launch Center Pro is an app which uses URL schemes to hook itself into other apps which support them. At its simplest, it lets you launch an app, but the real meat comes when an app lets you send data directly inot it from elsewhere. OmniFocus uses URL schemes which let you create a task, to add text to that task’s title and to add notes. Launch Center Pro will send various pre-defined snippets (similar to TextExpander Touch) to the app, including the contents of the clipboard. Thus, you can quickly make a note from an email, or remind yourself to call a particular person, all with the main text already filled out. Sure, all of this can be done from OmniFocus itself, but anyone who has used launchers like LaunchBar or QuickSilver on OS X knows that they make things a lot faster. So, check out Michael’s video and then head over to his blog post to grab the URLs and add these various shortcuts to your own setup. It’s not like you have anything else to do this Friday afternoon, right?